First of the year and with excellent and varied entries. As this new year gets going and if you are thinking of entering your videos, have a think about putting some sort of story to the images rather than just a catalogue of species. It doesn’t have to be complicated. Even a simple graphic introduction would be good to set the film up and let audiences know what they are about to see. If you want to and are able to go a step further, think about a narration. Story lines don’t always have to graphic or verbal, they can be just visual. A sequence of developing and varied images that show some progressive event or type of behaviour in some detail will keep audiences engaged far longer. But if you are still new to this video making, don’t worry, it’s good to see your films anyway and hopefully I can advice on how to move to the next stage. As always please read the comments I have made to all entries as they may well help you too. It’s only by getting your work out there that help you to progress. The music made for a dramatic opening which was for me just a little too overwhelming for the images. But this is all down to personal taste and in the end it is whatever works for you and the audience. The opening turtle was a lovely developing shot which was nicely lit. The shark was a good size and must have been fun to dive with. The following reef fish were really nice, all well lit and framed as were the following collection of reef wildlife. The feeding ray was a bonus. You did well to get that close. The film was eleven minutes long which is quite extravagant. In that eleven minutes there was a mixture of very good images along with not so good. Try to be a little more brutal with your editing selection. I personally would have taken the film down to five minutes and taken out the not so good clips as they tended to bring down the better ones. As I seem to be saying each month, ‘less is more’. It is better to leave an audience wanting to see more rather than feeling they have seen to much. Hope this helps. Back to the film. I like the surface sequences that introduce the location, especially the drone shots. The transition to the underwater section worked well and the following underwater clips were very well shot with good lighting and framing. Excellent quality to it all. Hi again Thomas. You have certainly been busy. Another nice film with plenty of good images. The turtle on the wreck was nice. Good opening with the beach and the dolphins right up front peaked my interest. The following variety of wildlife shots were very good and well edited to the music. At this point I felt I knew how the rest of the film was going to pan out but then you really took me by surprise. 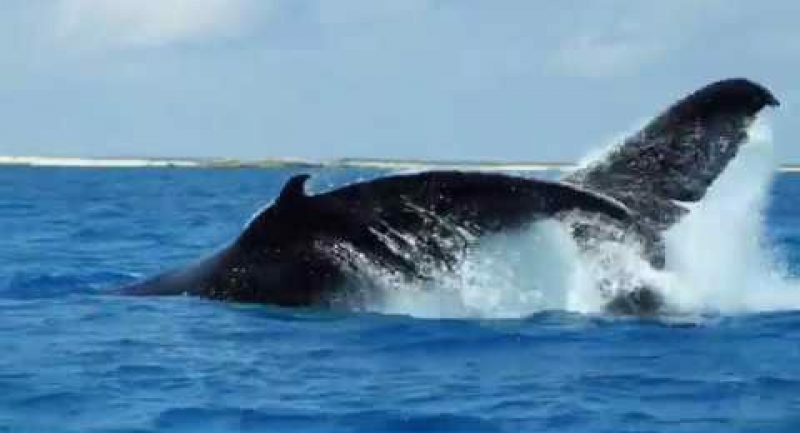 Humpbacks in the shallows and a snorkeller looking very very happy. Excellent moment. Then back to the other reef life. I did like the flow of this. Kept me guessing and kept me interested. The wreck was nice but do take care with colour balance. The sea looked purple. Then back to the reef with more wildlife, all edited perfectly with the music. Some good subtle camera moves in there too. Finishing with the whales was perfect. Great film. The information graphics up front were so important. Simply done but gave the film purpose. Lovely drone opening giving a good sense of location and habitat. The mass gathering of the Convict Surgeon Fish is a wonderful spectacle and you captured it very well. Great bonus having the sharks there too. Music choice was very good. Well done for coming back to the drone for an extra point of view. That was very welcome and gave the video an extra dimension. Very dramatic. Good suspense opening with the divers prior to seeing the first shark. Big sharks too. Very strong images of them coming through the shoaling fish. You did well to show the whole story with both sharks and divers. Many films I see like this only concentrate on the sharks and ignore the divers, but you captured the whole deal. Well done. I’m personally not a fan of shark feeding but it certainly gave you many powerful images. Well edited and well shot. Seen this one before but absolutely no reason not to enter it again. Excellent opening to the video with the aerial and cultural scene setting. The visual and sound transition from land to underwater was very good indeed. Some wonderful animals in the following sequences but I would like to make a few suggestions for you. The first is to try and get at eye level with the subject instead of looking down, especially with the smaller animals. This will bring more dynamic shots and in trying to do this will give you more time to study what each animal is doing and thus capture some good behaviour. The second one is have a good look at close up attachments for your camera. They are not expensive but will allow you to fill more of the frame with greater effect. The schooling fish were lovely to see. As well as the wide shots try to get that little bit closer for a few mid and close ups. Perhaps you did try and I know this is not always easy as shoaling fish can be quite timid, but take your time and persevere. Turtle was nice, with very good lighting and exposure. The rays at the end were excellent. Great film. Well done. As you have gone so far in making a really good video, why not try to go a step further and add a story to it. Just some simple narration to make more of the excellent images. The winner this month is My Grand Turk – Underwater by Sabine Frank. Although the subject matter was incredible, it was the editing, the visual story and the camera work that won the day. Well done to everyone and looking forward to next month.